"Great value for an awesome location and friendly staff." Have a question for Goodstay Davinci Hotel? "Friendly staff who guide us to dinner restaurant and help to call a cab." "Hotel was clean and we had a nice view facing the sea with t..."
For travelers who want to take in the sights and sounds of Gangneung-si, Goodstay Davinci Hotel is the perfect choice. From here, guests can enjoy easy access to all that the lively city has to offer. 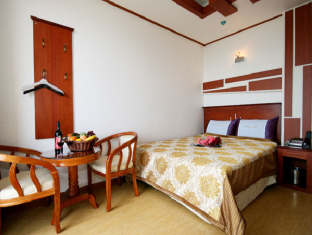 A well-kempt environment and its proximity to Jeongdongjin Sunrise Park, Jeongdongjin Beach, Wangsan Johyung Yonguso give to this hotel a special charm. First-rate hotel services and facilities that define the Goodstay Hotel experience await you at the Goodstay Davinci Hotel. The hotel provides free Wi-Fi in all rooms, daily housekeeping, private check in/check out, taxi service, 24-hour front desk to ensure our guests the greatest comfort. 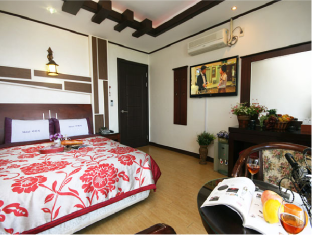 Guests can choose from 22 rooms, all of which exude an atmosphere of total peace and harmony. Whether you're a fitness enthusiast or are just looking for a way to unwind after a hard day, you will be entertained by top-class recreational facilities such as garden. Goodstay Davinci Hotel is an ideal place of stay for travelers seeking charm, comfort and convenience in Gangneung-si. It would be better to come here if you dislike the vibe like Korean Traveling Spot but also you can enjoy the view and focus on yourself with quiet night. Pros: wonderful view from room. can see the sea and spectacular jeongdongjin sunrise. friendly staff who guide us to dinner restaurant and help to call a cab. Cons: far from train station. located up on a hill, secluded and not within walking distance. exterior and room is dated. We stayed here and it was really far from everything. It was clean enough, but the room smelled like smoke. Even though the place was rather inaccessible by foot (they were surprised to hear that my friend and I walked to the hotel from the bus stop! ), the super helpful staff would drive us to the main area/jeongdongjin station and even picked us up after our dinner. Pleasant stay. Took a cab from Jeongdongjin train station to the hotel, it was less than 10 minutes away, costed us KRW 5,400 - reasonable and convenient. Hotel was clean and we had a nice view facing the sea with the Sun Cruise Hotel at the side nicely lit at night. It has an elevator. One minor setback was that the restaurants were not within walking distance (at least not in the cold weather), but the hotel owner was nice enough to recommend a good restaurant, drive us there and pick us up later. He also drove us to the train station after we checked out. Great value for an awesome location and friendly staff. It is a bit out of the way, but the view from the hotel room toward 정동진 is amazing. Our stay was very pleasant. We did not have a car so the owner would drop is off at the beach and pick us up everyday without hassle. He was very friendly and helpful, he even bought is coffee on our last day. The motel is on a top of a large hill which gives it excellent views but also means there is a steep walk down to the beach. So being dropped off by the owner was great and made the experience very pleasant. The rooms were great with a flat screen tv, air con, makeup station and coffe table that you can sit at and look out over the balcony. There was however no room service or maid service so we had to tidy the place ourselves. There was a small bath with a shower on the wall so it isn't technically a wet bathroom, but there was no shower curtain so everything did get wet when we took a shower. They use google translated for communication. I can feel they really want to help however they only can understand easy english. No food at the hotel, you have to dine out or buy some food in advance. I think the price is a bit high for me before checking in. After I check in, I feel it is worth as there is same view with the next hotel. The hotel price is very very high. Super kind owners and a great view of the ocean! We had two separate reservations but they moved our rooms closer together without even being asked to do so. They seem to appreciate any attempt to use Korean. We asked them how to get a bus to Gangneung and the man drove us to the bus stop. The next morning upon we asked for a restaurant recommendation and were again driven to the restaurant and also were bought a free order of tofu. Just so amazingly helpful. Really made the trip for us. The staff was incredibly friendly and helpful, the view from the balcony was beautiful, and it's only ten minutes walk to the beach. After living here 3 years and traveling the country extensively, this was definitely the best experience I have had at a hotel in Korea! The hotel manager and his wife were very friendly and helpful and went above and beyond to provide us with a good holiday! Whenever we asked for help, they gave us more help than we expected. For example, we asked where a good restaurant was, and they actually brought us there. It was during the week, so perhaps it was a less busy time for the hotel. Also, even though we only booked for two people on Agoda, they gave us extra Korean style floor bedding for our third person. My friends and I were so impressed, we wrote the hotel manager and his wife a thank you note! If you are a foreigner who speaks enough Korean to have a very basic chat with a hotel manager, I highly suggest this hotel! They were incredibly kind and had great advice about restaurants and beaches. They genuinely cared to make sure we had a great trip and were so pleased/amused to speak Korean to foreigners. The only negative aspect about this hotel is that a taxi from Gangeung Bus Terminal cost 25,000 won, and it is on top of a hill (ten minute walk down to the beach). However, the location on the hill makes for a BEAUTIFUL view of the ocean and Jeongdongjin Beach area. And, we were able to catch a bus back to the terminal on the return trip to save money. I will definitely stay here again! Comfortable room. View incredible. Value. Please be advised that the hotel is great but customers with mobility problems should forget it. Its on a very steep hill. Having said that, if you are fit you can climb it evrn with a belly full of soju. I have to say that the seaview is marvelous! Location-wise, unless you have a car, it could be a pain by foot (especially if you are carrying heavy luggage). The next best option is to take a cab from Jeongdongjin train station, which will only cost you USD3-4 (and 7-10mins to reach). On the day of arrival, it took me about 60mins to reach the hotel by foot (also because we weren't sure where the hotel is). Otherwise 35-40mins should suffice. There were no directions to the hotel on the internet, and the only piece of info I had (from a previous commenter here) is to walk in the same direction leading to Suncruise Resort. Take note that once you see the big anchor, instead of turning left, just walk straight up the steep road. 5 minutes later, you will see the hotel on your left. One thing I'd like to highlight here is that the hotel signage (in Korean) says Davichi Motel (instead of Goodstay Davichi Hotel) which confused us. If it's of any help, next to this hotel is Davichi Resortel (signage also in Korean). Thankfully, the hotel allow us an early check-in so we got to rest a bit before going out, at the same time enjoy the seaview. Toothbrush & paste is provided, but bring your own towel.